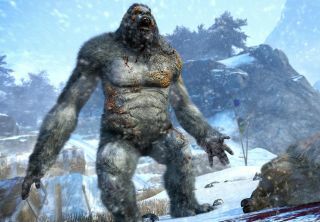 With the Far Cry 4 DLC Valley of the Yetis just a day away, Ubisoft has released a walkthrough video showing off some of the tasks that await players in this interesting new region of Kyrat, and an up-close look at the hairy fellow who give the add-on its name. The video begins with Ajay Ghale's capture of an outpost controlled by a cult that's the primary enemy in this part of the world. Once taken, it becomes his base, and must be fortified against enemy attempts to recapture it, either through purchases or by completing various side quests. The cult will attack every night, and each battle will be tougher than the last, making those fortifications effectively mandatory. It's all very Far Cry—bombing around on vehicles and shooting hordes of dudes in a gorgeous open-world—but set in a new area of the Himalayas, which just so happens to be populated by Yetis. As the video makes clear, they're awfully tough, although I find it a bit suspect that thumbing them in the eye is a more effective method of slowing them down than emptying a machine gun into their faces. Valley of the Yetis comes out tomorrow—that's March 10—and will be available as a separate purchase or as part of the Far Cry 4 season pass.